Mathematics professor Mark Klespis has been named acting chair of the department of mathematics and statistics. Klespis will serve as acting chair for at least a year while Jaimie Hebert, the former chair, serves as interim dean of the College of Arts and Sciences. “ Dr. Klespis’ strong background in math education fits well with our proposed doctorate in math education and should further strengthen our case with the coordinating board as he provides leadership for the implementation of this new program,” said provost and vice president for Academic Affairs David Payne. A professor at SHSU since 1995, Klespis earned his bachelor’s and master’s degrees in education and mathematics, respectively, from the University of Texas at El Paso before receiving his doctorate in mathematics education from the University of Texas at Austin. One of Klespis’ biggest goals for the program is to “keep moving forward” with things such as the doctorate program in mathematics education, a degree the department and university have been working on for the past few years. The Higher Education Coordinating Board will visit the department sometime this fall, and “I want to make sure we’re ready to go with that and give a good impression,” he said. This will accompany a “beefing up” of the Master of Science in math program, he said, along with his goal of continuing to serve the large numbers of students signing up for the introduction-level math classes required for many degree plans. In addition to his work at SHSU, Klespis has also taught at Saint Xavier University, Western New Mexico University, the University of Alabama at Birmingham, served as an assistant instructor at the University of Texas at Austin and taught high school math at Anthony High School in Anthony, Texas. “ It is an honor (to be named acting chair),” Klespis said. “I’ve been at here Sam for 10 years, and Sam Houston has been very, very good to me; the department has been very good to me. The College of Criminal Justice and the Correctional Management Institute of Texas will host a retirement reception for Dan Richard Beto on Aug. 31. The reception will be held from 3-5 p.m. in the Criminal Justice Center lobby. Beto, who received both his bachelor’s and master’s degrees from SHSU, began his career with SHSU in 1994 as executive director of CMIT, the position from which he will retire. In 2000, he was named director of the Center for Project Spotlight, a program initiated and funded by the Governor's Office that creates partnerships between law enforcement, juvenile probation, and adult probation officers to provide intense supervision and enhanced services to juvenile and young adult offenders on probation living in high crime areas. 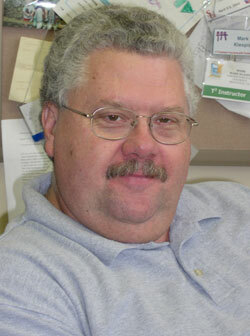 In addition, he has served as an adjunct faculty member for the college since 2000. Beto’s last day at SHSU will also be Aug. 31, though he already has plans for his retirement. “ I plan to try to get my life back in order (probably a lost cause), train my ill-behaved dog (which is another lost cause), write, consult, and travel some with my wife,” he said. In celebration of her more than 25 years of university service, the purchasing department will host a retirement reception for Allene Smith on Aug. 31. For more information, call 936.294.1894. 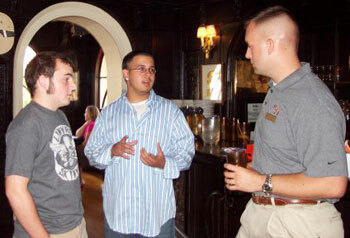 (above) Incoming freshmen talk with admissions counselor Jacob Bullion at the DFW send-off party on Aug. 9. (below) The party allowed students to meet others from their area and form friendships that "will carry over into the fall semester," according to Dallas-based recruiter Jason Hale. The Office of Undergraduate Admissions welcomed approximately 35 Dallas-Fort Worth area students as Bearkats with a reception at the Hard Rock Café in Dallas on Aug. 9. The pilot “send-off party,” designed to welcome incoming freshmen from the Metroplex, as well as give them an opportunity to connect with other new students from their hometown, was a “really great success,” according to Dallas-based recruiter Jason Hale. “ We wanted to show students that Sam Houston is a caring university and that we really wanted to welcome them to the university,” Hale said. The informal event, themed “Celebrate Your Admission To SHSU,” consisted of appetizers and drinks, door prizes and vice president for Enrollment Management Heather Thielemann discussing what the students should expect when they get to SHSU. In addition, almost 20 parents were given information on whom they could talk to for various purposes. “ We really wanted to make sure they felt comfortable and calm about their children going away to college,” Hale said. In addition, several students were able to meet their roommates for the first time, Hale said. With the success of this event, the office is planning another send-off party next year for the DFW area, as well as parties in Houston, San Antonio and possibly Austin, he said. Huntsville friends of Walter and Cynthia Bennett have scheduled a number of fund-raising events for Ashley Bennett, their daughter and granddaughter of long-time SHSU faculty member Walter Bennett, Sr.
Ashley was born May 13, 2004, along with twin sister Morgan. Two days later Ashley was diagnosed with necrotizing enterocolitis, an extremely serious disease of the small intestine. Her parents were advised to "remove support" but would not give up. Ashley has had to return to Texas Children's Hospital in Houston for appointments every few weeks and has been hospitalized three times since her December 2004 discharge.
" Obviously, Ashley has a long way to go, and the future is still uncertain," the www.ashleysmedical.com Web site said. "While the family is fortunate to have had at least part of her medical bills covered by insurance, it doesn't cover the entire needs of Ashley." Donations may be made to the Ashley Bennett Fund and mailed or delivered to First National Bank of Huntsville; ATTN: Gwen Ritter; 1300 11th St.; Huntsville, TX 77340. Upcoming events include a Huntsville Rotary McKenzie's Barbeque Sandwich Lunch from 11 a.m. to 1 p.m. on Sept. 16. Rotarians will be serving sandwiches at the First United Methodist Church, with options of pickup, delivery or dine in. A benefit golf tournament is also scheduled for noon that day at the Raven Nest Golf Course. Contact George Miles at 936.294.8012 for entry details. Raffle tickets for a handmade quilt are also being sold at First National Bank, with the drawing scheduled for Oct. 1 during Fair on the Square. 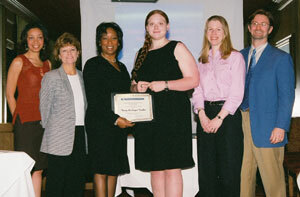 Ashley's parents, Walter and Cynthia, both earned degrees from SHSU in 1993 and 1996. Walter Sr., professor of sociology, earned degrees in 1961 and 1962, and has 37 years of classroom teaching service. Administrators from the Sistema Para El Desarrollo Integral De La Familia in Puebla Mexico recently visited SHSU's counseling program to discuss what SHSU can do to help Puebla's increase in suicides. Pictured are Lic. Miguel Martinez Garcia, Judy DeTrude, Marlene Moriarity, Lic. Alejandro Armenta Mier, Richard Watts, Carol Parker, Yvonne Garza and YuFen Lin. Sam Houston State doctoral students from the counselor education and educational leadership programs attended and presented at an international conference during their internship experience this summer in Puebla, Mexico. The conference, sponsored by Sistema Para El Desarrollo Integral De La Familia, which represents the governmental organization in Mexico that meets the needs of the family, focused on family violence and suicidal prevention. Those who presented from the counselor education program included doctoral students Roxie Riefkolh and Marlene Moriarity, as well as faculty member Judy DeTrude. The educational leadership students who spoke included Marilyn Denison and William Chapman, as well as faculty member Alice Fisher. The DIF administration requested ongoing collaboration with SHSU’s counseling program, and DIF administrators, including DIF director general Lic. Alejandro Armenta Mier and subdirector Lic. 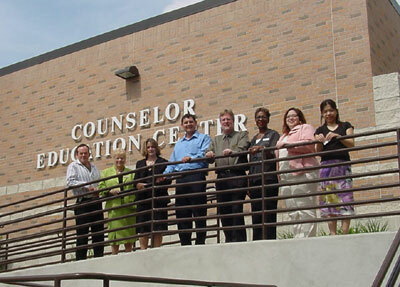 Miguel Martinez Garcia, recently came to SHSU for a meeting with the counseling faculty and several doctoral students. Since their main concern in the state of Puebla is the increase in suicides, most of the meeting was focused on what SHSU can do to help with this problem, according to Judy DeTrude, associate professor and director for the center for research and counselor education. Allen Hightower, associate professor of music and director of choral studies, has been appointed as the new part-time music director for the Houston Masterworks Chorus. As director, Hightower, who began with the chorus this past July, will conduct and plan the music and concerts for the season, which is generally comprised of around four concerts. Hightower said he feels the position will give SHSU’s choral program more exposure. “ People in the Houston arts community will come to know my work with the Houston Masterworks Chorus, and through that, SHSU's choral and voice programs will gain more visibility,” he said. This year, the city’s largest choral group celebrates its 20th anniversary with programming that ranges from Beethoven’s Mass in C to love songs by Cole Porter. For more information on the semi-professional chorus, visit its Web site at www.houstonmasterworks.org. Junior Casey Tucker (third from right) was selected as the first scholarship recipient from the Houston-area alumni chapter of Beta Gamma Sigma. SHSU junior Casey Tucker was recently recognized by the Houston-area alumni chapter of Beta Gamma Sigma International Business Honor Fraternity as its first ever scholarship winner. Tucker, a Huntsville native, is a general business major who has maintained a 4.0 grade point average. 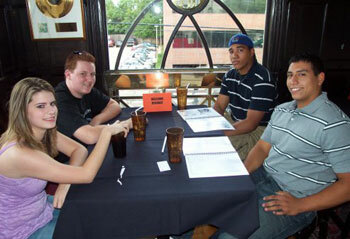 The scholarship competition was open to students at all universities in the Houston area. Those who submitted an application were also required to write an essay discussing the importance of honor, wisdom and earnestness, the organization’s three principles, as they relate to successful business careers in the 21st century. The mission of Beta Gamma Sigma, an accredited organization, is to encourage and honor academic achievement in the study of business, as well as to foster personal and professional excellence among its members.